I don't have an actual bookish bucket list, but if I did "working at a bookstore" would be near the top. And now I can (pretend to) cross it off! 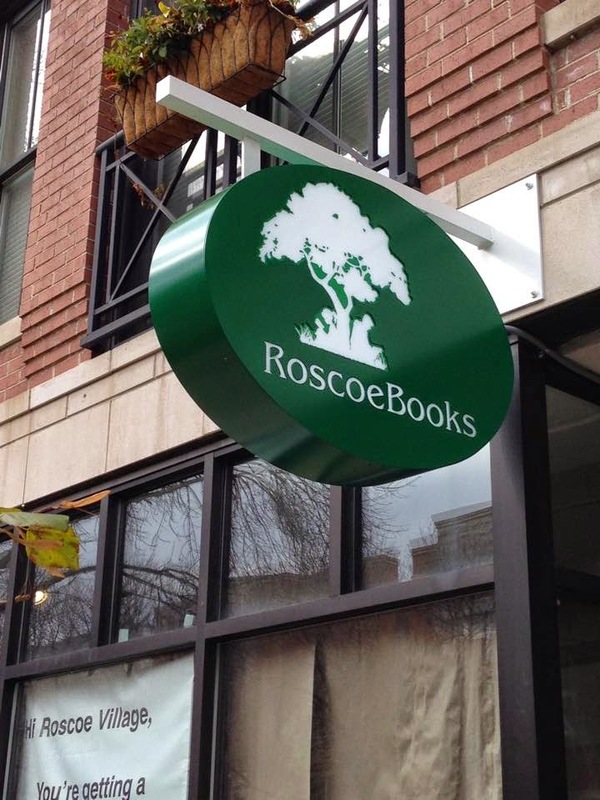 A new indie called RoscoeBooks is opening just a few blocks from where I live here in Chicago, and despite the fact that this is damn near akin to hiring an alcoholic to bar tend, the owner is graciously allowing me to work there a few hours a week. I couldn't be more excited! The store opens this Saturday, Nov. 22 — if you're in Chicago, come say 'hello.' I'll be the one with ridiculous perma-grin-goofy-happy smile on my face. And but, one of the reasons I'm super excited to be a bookseller is, yes, to be able to recommend books I love to other people, but also to learn more about what other people are reading that fall outside my immediate comfort zone. Another reason I'm excited is working at a bookstore will only make it more apparent that there's always something to learn about books. So in some ways, this is selfish excitement, because I'll get to discover books I may have otherwise missed. And that's already happened just in the last week as a result of talking with the other booksellers (see below) and helping to shelve (I assume it's natural to talk to the authors as you shelve their books, right?). So anyway, yeah — I'm stoked. This...will be fun. Submergence, by J.M. Ledgard — If you've never heard of this book, don't worry — I hadn't either until a few weeks ago. But the new owner of RoscoeBooks recommended this, and I read it in about two sittings. It's a short novel about a guy named James who is a British spy and gets kidnapped by Islamic extremists in Somalia. It's also about a woman named Danny who is a biomathematician — she studies microbial life in the deepest depths of the ocean. And finally, it's about how the two met, and how they discuss life, and why we're all here ("We're nature's brief experiment with self-awareness," Ledgard writes — a mind-blowing idea, when you really think about it. ), and chance and luck, and art and literature, and it's just fantastic. The story's told in brief snippets, alternating perspectives between Danny and James, and between the present day, and when the two met at a French hotel on the Atlantic coast. If you've read and enjoyed Anthony Doerr's All The Light We Cannot See, I think you'll love this, too. The Book of Strange New Things, by Michel Faber — This big, sprawling novel has one of the more inventive premises of any novel I've read in awhile. It's about a Christian missionary named Peter who is hired by a mysterious corporation called USIC to travel to a distant planet (which humans have dubbed Oasis) to preach the Bible to the native population (which Peter calls Oasans). Peter must leave his beloved wife Bea— who was his savior when he was a drug and alcohol addict, and who was his reason for his being "born again." Life on Earth in general, and his wife Bea's life specifically (as he learns by communicating with her via a rudimentary emails machine — and Faber includes these missives at great length), begin to deteriorate and Peter feels helpless, but has success with the Oasans. Peter is the second minister to visit Oasis, and the Oasans, who refer to themselves as Jesus Lover Five, Jesus Lover Thirty, etc, are eager to learn more about Jesus. The novel, though often a bit too deliberate, is an interesting reflection on the egoism inherent in particular religious doctrine (being so sure you're right and everyone else is wrong) specifically, but humanity in general. When you finally see the whole picture —why the Oasans want a Christian minister and to learn about "The Book of Strange New Things" (the Bible) — you'll realize it's a conclusion that matches the ingenuity of the whole plot itself. But it's just a really long walk to get there. A Map of Betrayal, by Ha Jin — I loved Ha Jin's novel War Trash, but I was only so-so on this one. It's the story of a Chinese spy who spends the last half of the 20th century in the U.S. taking an American wife and working at the CIA. It's also the story of his daughter, who in present day, is trying to learn the truth about her father and the rest of his family — her father had a whole other family back in China before he came to the U.S. It's a short, brisk novel that I thought actually read more like an outline for a novel than a novel itself. What's here is intriguing, but it just felt too slight. Woot! A bookaholic working in a book store!!! !